NYC’s City Winery opened a sister restaurant/wine garden called City Vineyard at Hudson River Park’s Pier 26 over the summer. This winter they’re hosting a concert series called “Voices on the Hudson” which will happen every Tuesday and Wednesday now through mid-April. The shows are intimate, each limited to 100 seats, and things kick off tonight (1/24) with acclaimed singer-songwriter Michelle Shocked. On Wednesday (1/25) it’s Bobby Bare Jr & Elvis Perkins. Other announced peformers include Joseph Arthur, Ben Lee, Lucy Wainwright Roche, Jill Sobule, and more. All shows are $20 and general admission, with seating/dining starting at 4 PM and music starting at 8:30 PM. Tickets are on sale now. 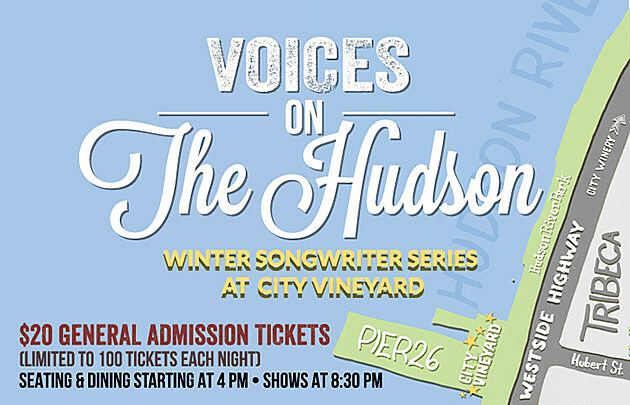 Check out the “Voices on the Hudson at City Vineyard” lineup though March, below.